1. Preheat the oven to 200°C, gas mark 6. 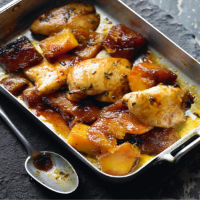 Cut 2 chicken breasts lengthways in half, then place in a small roasting tin along with about 10 pieces frozen essential Waitrose Butternut Squash (or 350g butternut squash cut into chunks) and 1 tbsp finely chopped fresh rosemary. 2. Pour over 4 tbsp Waitrose Canadian Maple Syrup No2 Amber and 2 tbsp groundnut oil and turn to coat everything. Cook for 25 minutes, turning once half-way through the cooking time, making sure the chicken is cooked through with no pink meat.